Spring symbolizes new life, doesn’t it? 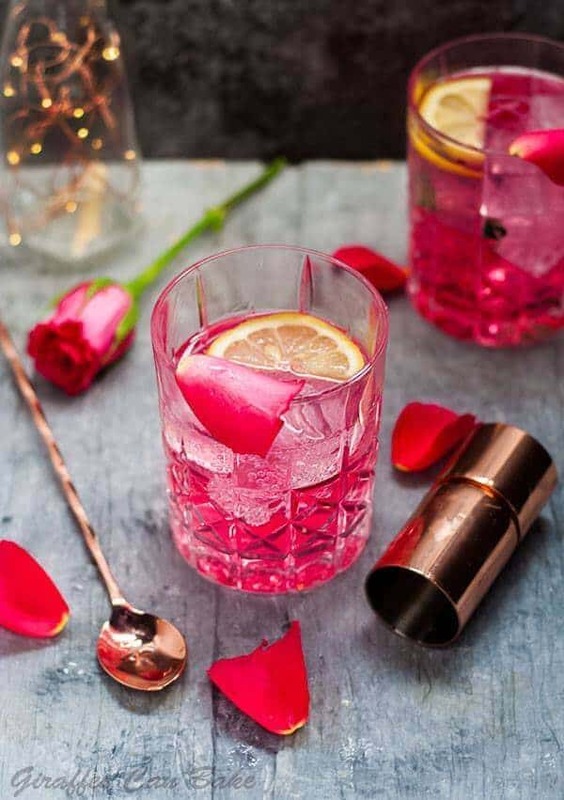 Today I’m bringing you a lovely Beet and Gin Cured Salmon Recipe as part of a celebration of new life – a Virtual Baby Shower for our dear friend (and fellow food blogger) who recently welcomed a new baby boy to her family! A salmon fillet is marinated in beet and celery juices, gin, and savory herb bitters, then cured with salt, sugar, and fresh herbs. Served with Quick Pickled Cucumber and Shallots, Watercress, and Preserved Lemon Yogurt, this dish is so pretty, and sure to please! 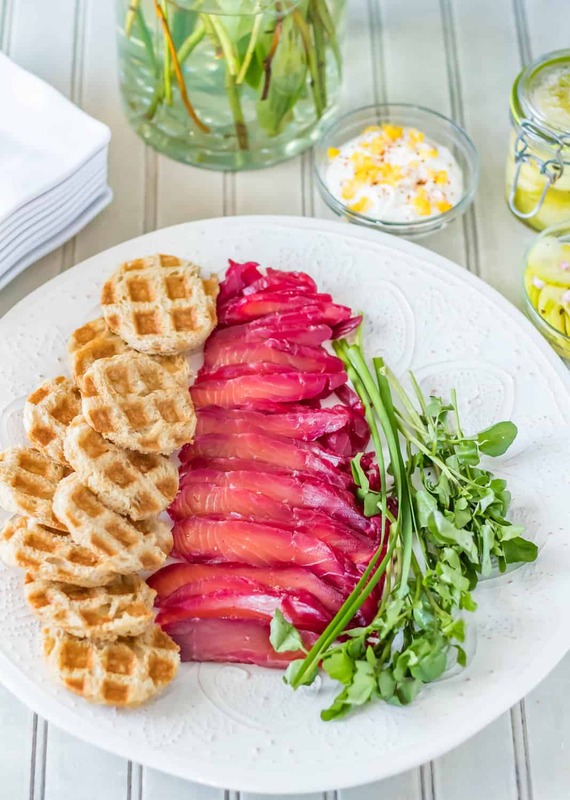 Today I’m giving you just a short rundown on this amazing Beet and Gin Cured Salmon Recipe, but you’ll likely find it at the bottom if you keep scrolling. 😉 The “Reader’s Digest condensed version” is this: Start with a lovely piece of salmon with no fishy smell. Purée the beet, celery, onion, gin, and bitters, then strain through a fine mesh sieve. Pour into a zip bag. Add your prepared salmon. Marinate overnight, and up to 24 hours. Remove the salmon and pat dry. Smear with the curing ingredients, and wrap tightly with plastic wrap. Place in the refrigerator for 48 hours, turning every 12 hours or so. Wipe the cure off with a clean cloth, and slice thin to serve! 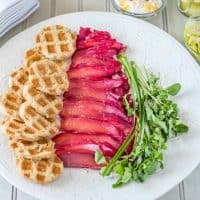 I served my Beet and Gin Cured Salmon with rye bread cut in rounds (with a biscuit cutter) that was brushed with butter and pressed in a waffle iron. Multigrain crackers or flatbread, and dense rye is great too! Accompaniments include my Easy Moroccan Preserved Lemon Yogurt Sauce with Fresh Herbs, Quick Pickled Cucumber and Shallots (recipe in the post), and fresh watercress. A food blogger’s life can be a lonely one. I spend 8-12 hours per day with my computer, and at least 8 of those with only my 2 dogs for company! What’s an extrovert to do? I’ve been a member of a “Food Bloggers Support Group” for about 2 years. It’s an online chat on Facebook Messenger. They’re my friends. My colleagues. My lifeline at times. Love. These. Ladies. We, being the foodies and drinkies (is that even a word?) that we are, decided to plan a #virtualbabyshower to honor our friend and (hopefully) send some traffic her way as she and her husband adapt to life as parents. So, several us (that weren’t overwhelmed by pressing deadlines) have come together to celebrate our friend Meghan, her husband Kansu, and baby Finley Fox Dincer. 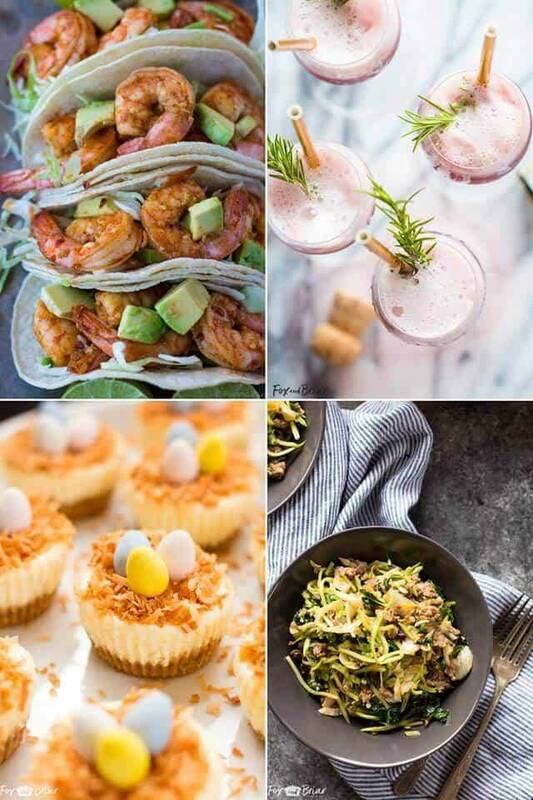 She’s taking a little time off for family bonding, but you really ought to head over to Fox and Briar to check out her amazing recipes! This curated photo shows a few of my favorites! 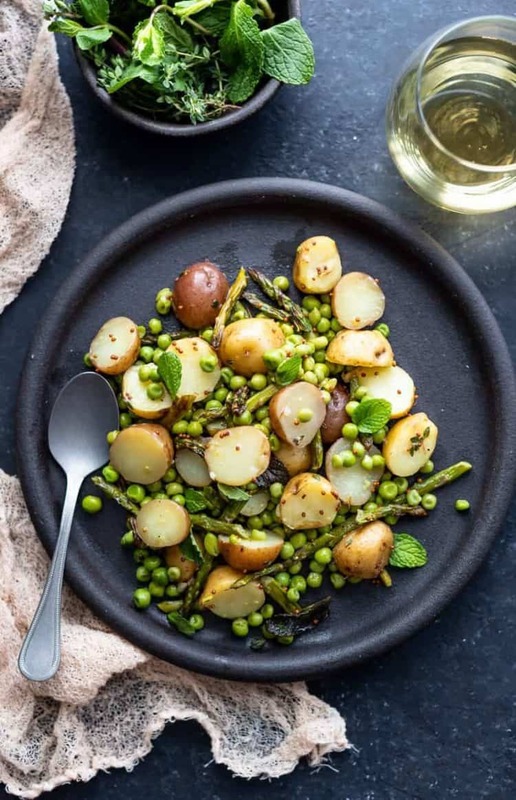 Here’s to spring, new life, baby Dincer, and amazing food! 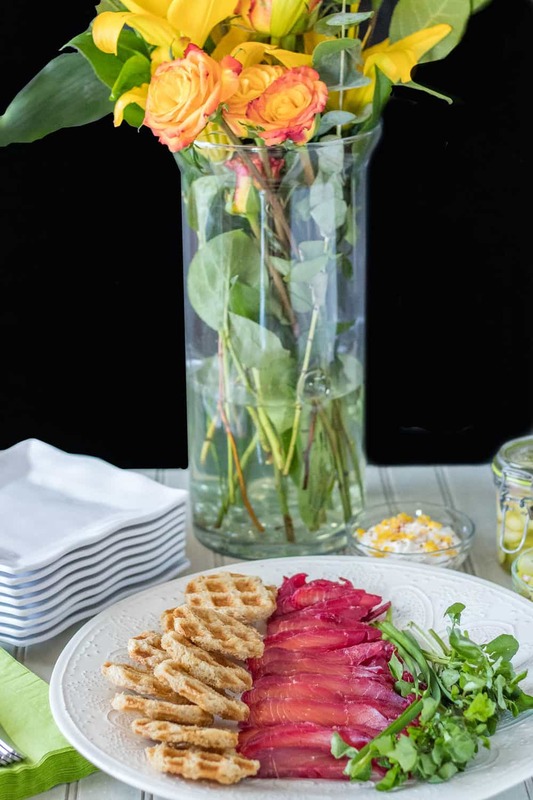 Plan ahead a little, but this Beet and Gin Cured Salmon is an elegant, healthy, flavorful dish to serve for a spring event (ie. #virtualbabyshower). Served with quick pickled cucumber and sweet onion, preserved lemon yogurt, watercress, and rye bread, flatbread, or crackers, it's sure to be a favorite! 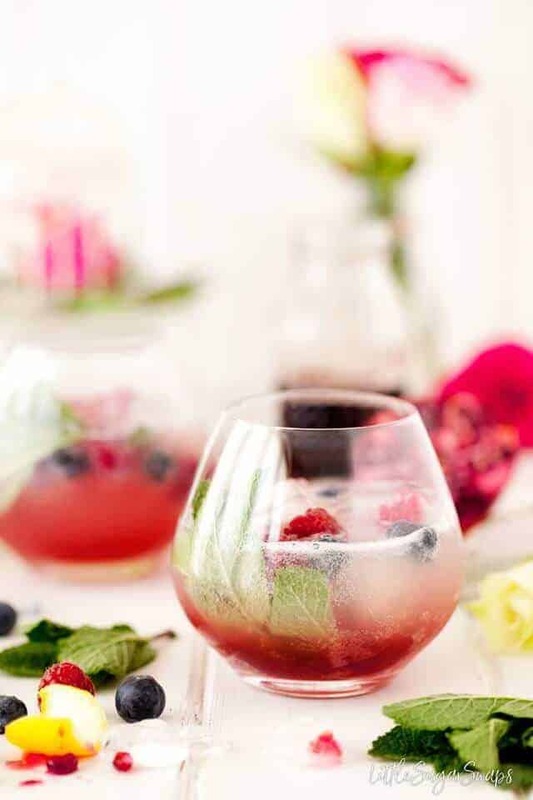 1/2 cup gin, doesn't have to be "fancy"
Prep your salmon fillet by removing any skin, fat, bones. Rinse and wipe dry. To a blender or processor, add beet, celery, and onion. Puree until smooth. Press through a fine-mesh sieve. 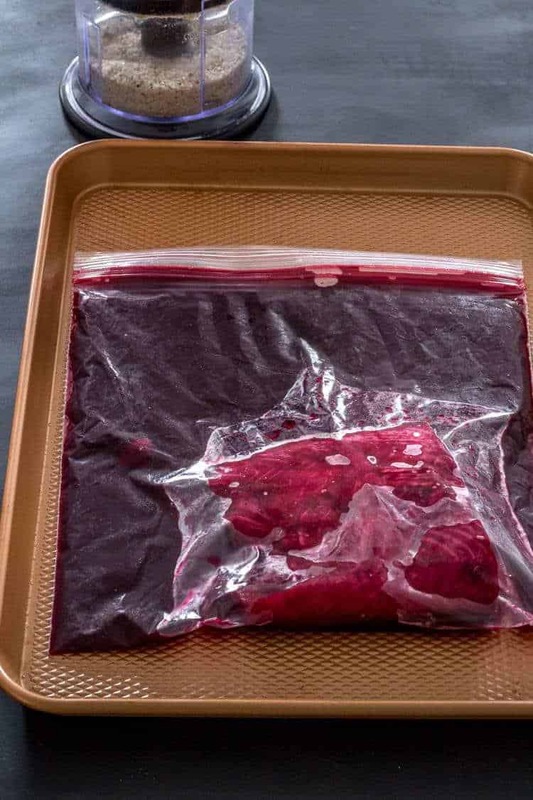 Add the juice, gin, and bitters to a 1 gallon zip bag. Add the prepared salmon. Zip tight. 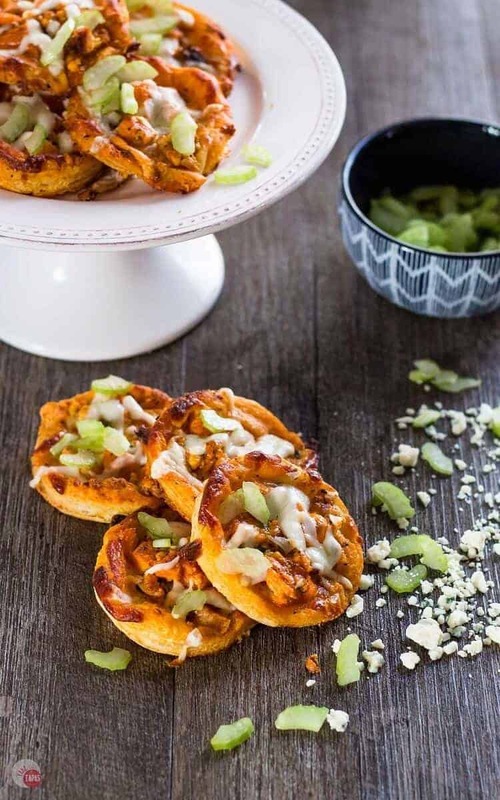 Place in the refrigerator for approximately 24 hours, turning halfway through. Remove from the zip bag. Pat dry. Add peppercorn, allspice and juniper berries, and dill seed in a spice grinder or mortar. Grind or pulverize. It does not need to be fine! Add ground spices to lemon zest, salt, sugar, and dill. Mix thoroughly. Rub the cure all over the salmon fillet. Wrap with plastic wrap tightly. Place on a plate in the refrigerator. Turn ever 12 hours for 2 days. Wipe off the cure (don't rinse). Slice thin prior to serving. Make the cucumber and shallot pickle up to 2 days in advance. Prep the cucumber and shallots. Set aside. In a small saucepan, add remaining pickle ingredients. Bring to a boil, and cook until sugar is dissolve (2-3 minutes). Remove from heat, pour into prep bowl, and cool completely. Add sliced cucumber and shallots. Pickle 30 minutes to 48 hours. Store in the refrigerator until used. We don't love leftover fish. Most of the time, I'm cooking for 2. I cured 16 ounces of good salmon fillet. The marinade will easily do twice that much. Buy fresh or flash frozen salmon. Know your source. I have recently started making my own bitters. However, I've used Bittermen's Scarborough Savory Herbal Bitters and love them! Alternatively, they're optional, and you can omit! 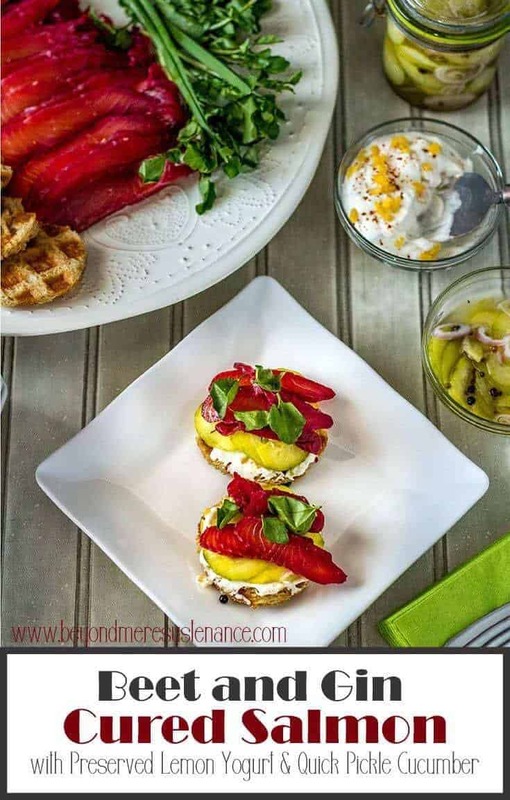 Easy Moroccan Preserved Lemon Yogurt Sauce with Fresh Herbs is an amazing base layer for these Beet and Gin Cured Salmon finger sandwiches! I sent hubby for dense, square rye bread (you know the type?). He couldn't find, and brought home standard rye. I used a biscuit cutter to cut rounds, brushed them with butter, and pressed them in my waffle iron. We loved them! Be creative! Sub arugula or micro greens for the watercress if desired. Macronutrients are an approximation only from MyFitnessPal.com. The salmon does not absorb all the brine, and there's no way to quantify toppings and base. I did include the cucumber pickle with the salmon. Lots of lip-licking going on from me. I cured some salmon recently and I was impressed with the ease of the process and the results. I love all of your additions, especially the savoury bitters. I'll be surprising my man with this before too long. You've done a great job pulling us all together to create this #virtualbabyshower. Thankyou, Tamara. I'm so glad to hear you don't find the process intimidating! It really is pretty straight forward, and not a lot of "active" time. I hope hubby loves it! And it was my pleasure to coordinate this event! I love working with my blog buddies! I really wish we could have hosted this baby shower in real life, so that I could have eaten every one of the recipes. Can't complain, though, since the cured salmon was excellent! Woman! This is so beautifully creative! Absolutely perfect brunch fare. 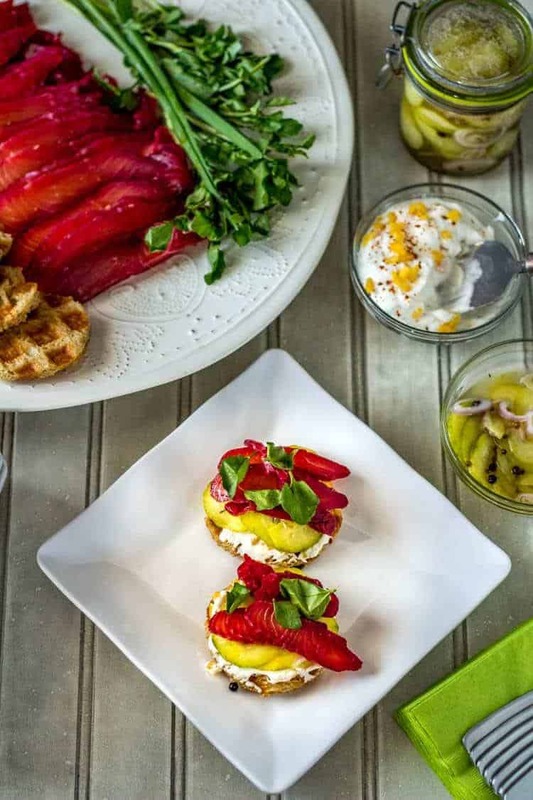 This Beet and Gin Cured Salmon is perfect for spring, and even better for this Virtual Baby Shower - well, actually, would be even better if it wasn't virtual so I can enjoy some right this second!! !